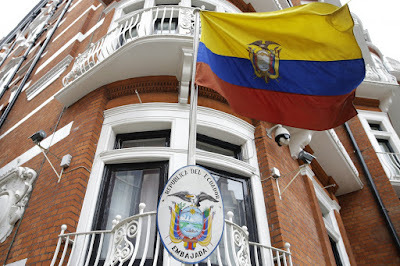 QUITO, Ecuador — Ecuador’s government acknowledged on Tuesday that it had “temporarily restricted” WikiLeaks founder Julian Assange’s internet access at its embassy in London after the whistleblowing site published documents from Hillary Clinton’s presidential campaig. A foreign ministry statement said that while it stands by its decision in 2012 to grant Assange asylum, it doesn’t interfere in foreign elections. Leftist President Rafael Correa’s government said it was acting on its own and not ceding to foreign pressures. The ministry didn’t specify the extent of the restrictions on Assange’s access to the internet, saying only that the limitations wouldn’t affect WikiLeaks’ ability to carry out its journalistic activities. The announcement confirmed Wikileaks’ claim that Ecuador was behind the cut-off but disputed its assertion that the decision was made because of U.S. pressure. Ecuador needs to boot Assange from its embassy and allow him to face trial in Sweden.